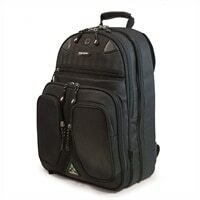 Mobile Edge ScanFast Backpack - Laptop carrying backpack - 17.3-inch - blackThe TSA has announced guidelines that allow travelers with properly designed carrying cases to pass through security checkpoints without removing their laptops. Mobile Edge has responded by creating the ScanFast Collection, each case is uniquely designed to provide an unobstructed security scan of the computer. If you’re traveling with your laptop, let Mobile Edge make your trip through the airport faster and easier with the ScanFast Laptop Cases! DuPont Sorona main material requires 30% less energy to manufacture, reducing greenhouse emissions by 63%! The TSA has announced guidelines that allow travelers with properly designed carrying cases to pass through security checkpoints without removing their laptops. Mobile Edge has responded by creating the ScanFast Collection, each case is uniquely designed to provide an unobstructed security scan of the computer. If you’re traveling with your laptop, let Mobile Edge make your trip through the airport faster and easier with the ScanFast Laptop Cases!